This beautiful home is a brand new construction situated on Elk Avenue and within blocks of the downtown shopping district of Crested Butte. Recently awarded BOZAR Project of the Year, it is the perfect location for a true Crested Butte experience! This great one bedroom, one bathroom home has a bonus loft, wood floors throughout and high end finishes. Enter through the large mudroom and kick off your hiking boots or ski boots on the custom bench with built in shelving–great for storing all of your gear! Head into the living room and relax in front of the remote controlled gas fireplace or take a break on the couch in front of the TV. Enjoy the custom barn wood accents and modern finishes throughout all of the living spaces. French doors lead out from the living room to a large stone patio where you can take in the views of Mt. Crested Butte! The master bedroom is located off the living room and features a new King bed and adjoining full bathroom. The bathroom offers Jack and Jill sinks and other fantastic modern finishes. The loft is accessed via a spiral staircase and features two twin beds bringing the sleeping capacity to four. For those guests requiring separate sleeping, the couch has a queen-sized pullout. All furnishings have been hand picked for this property! The kitchen offers all new, stainless steel appliances and gas cooking. After a long day on the trail, whip up your favorite meal or cocktail. The dining table offers seating for four to enjoy family style meals. Did we mention the washer and dryer yet? Brand new, energy efficient machines are conveniently located just off the kitchen. There is also a back entrance off the kitchen that leads into the fully fenced yard. If you are looking for the ultimate Crested Butte experience, this gorgeous new home is the perfect location for your mountain getaway! "Attractive, comfortable cottage. 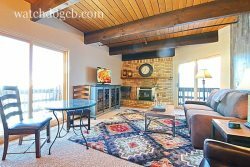 Beautifully maintanined home and an excellent base in charming Crested Butte villiage. The kitchen is well equipped and the main bedroom and bathroom are comfortable. The loft room up a spiral staircase would be best used for older children and teenagers. we loved our stay"
This property is strictly no smoking, both inside the house and the outside yard space. Thank you for your cooperation! Since this is a brand new property, extra attention will be paid to screening potential pet visitors (to avoid damage). Only extremely well behaved pets will be considered and additional pet fees and deposits will apply. All pets MUST be authorized by the office. There are three off street parking spaces for this home. Please note that during the winter season only two parking spaces are guaranteed due to snow removal. During the winter season, please be sure to abide by the posted Winter Parking Laws to avoid ticketing/towing. Grill is for summer use only.